I have around 40 radios, that is 35 too many. And having more dollars than wives is good too. Not one dollar will ever talk back nor nag me. Posted a little story related to this theme a couple years ago. Some hams didn't like it too much. KG7FIU, interesting and enlightening post. OK, I decided to downsize. Sold the TS570D, sold the IC910H. That leaves 2 x FT817ND, a TS520S, TS480SAT, Flex 5000 fully loaded with 2nd RX and ATU and V/U module, an MTR3B and a couple of simple transceiver kits that are either complete or midway through construction. Plus a VX6R and an HTX10 and 2 x HTX-252 2 meter rigs for APRS, also collecting dust. Still too much. I am giving serious thought to selling the TS480SAT. I kept it as a backup if the Flex has to go to the shop for repairs, and the 480 simply excels for remote and mobile operation, but it is collecting dust. The FT817ND are just too versatile to part with, plus I won't get much for them if I sell them. And they work fine for mobile operationalso (I don't normally get into pileups when driving, so QRP on HF is just fine for me). I have debated selling the TS520S, as it gets little use, but I still have it for sentimental reasons. Probably will sell both, make some room in the shack...not for more gear but for space to move around and reduce clutter. You are getting close to too many when you start lying to others about how many you have. When you start lying to yourself, you're a full fledged addict. I see it every day at work. Most commonly alcohol, heroin, crack, or cats are involved. In finale stages, one's too far gone to know how many. One can never have too many cats. Henry loves to sit on the desk right in my face when I try to pass vital, important, critical ham radio traffic. I am strict however. I won't let him operate. He hasn't a license. On 18.087MHz, Morse, 2200UTC. Won't you join me? No more than 200, tops!!! in working and non-working condition. The non-working rigs being the lesser amount likely 10%. A few years ago (2013), I had about 30 or so various radios, all working, all vintage. Plus another dozen modern radios like FlexRadio and new Alpha amps. And that does not include the radios I had at my workplace, which was a restoration shop. However, now I have less than a dozen. Why? I moved. I went from a house in the suburbs where I lived alone, to a co-op apartment in NYC with a roommate. My room is also my shack. Yikes! So now what I do I pick and chose carefully, and I turn-over radios a lot. I try something I hadn't had before, restore it, sell it and move on. This way I get to do my restorations, use a "new" or different radio, and then start over. I also allow others to get nice examples of well tested nicely restored radios. The only problem is sometimes I sell thing I regret, like my very mint Clegg Zeus/InterceptorB or my B&W 5100B. However, I did get huge offers for them so they had to go. Now it's my Gates M-5078 Transmitter which is getting offers. I had someone offered me a mint T-368 Transmitter in exchange. I thought they were joking, but they were serious. I didn't take the offer, and besides that thing is a beast. However, the Gates is so rare (it may be the only example still in existence) I do not think this will be a transmitter I will part with. So you can have hundreds of radios, just not at the same time. I kinda like this method, and the clutter is very manageable. Yeah ... I had a station at work. 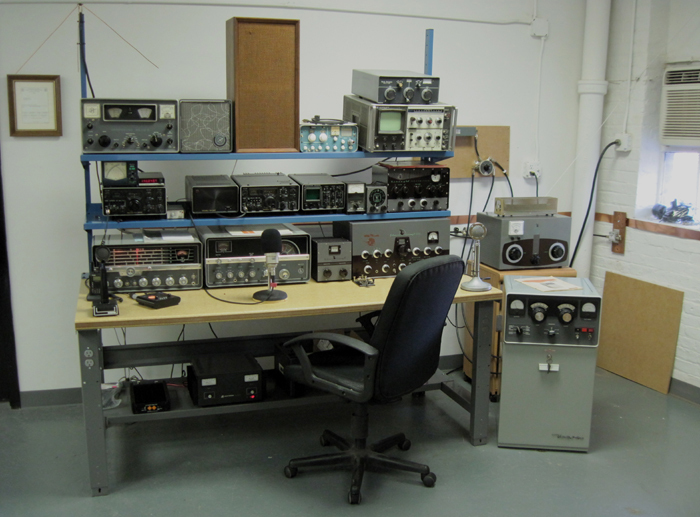 Here's a link to a pic of the vintage gear there, the modern radios were on another bench across the room ... (and the vintage station got bigger after this). Two are enough for me. Maybe three, if I ever get around to playing on 220MHz. I have just one radio, a Kenwood TS 570. It does everything that I need very well for me. lost count, 45 here I think. Just an observation: a lot of folks have reported on this thread that they own 10, 20, 25, 35, 45, or more radios and rigs. If everyone would go to sell their collections at the same time, the bottom would fall of the market, that is, cheap rigs. Imagine this - if even 1000 hams would offer 35 rigs each for sale = 35,000 rigs. Would you call that Ham Heaven? LOL, this whole thread is a collection of useless dribble started back in 2013 by a person who poses a thoughtless question. So since this thread is historic I will add my own opinion and take the arrows for it. One can comment on quality not quantity, etc. etc. The accumulation of many things in a hobby can go two ways: A desire to have many examples of radio equipment representing a variation of new features over a period of time.....Or......a hoarding fetish to miserly possess a lot of junk and gloat over it. Overt possession of many things is akin to gluttony; a curse that many hams suffer from.